Pelican International is following up their successful Catch 120 kayak in 2016 with the next generation Catch 120 NXT for 2017. The Catch 120 NXT is a kayak with the angler in mind. Everything you need to get out on the water and fish comes pre-rigged on this kayak. 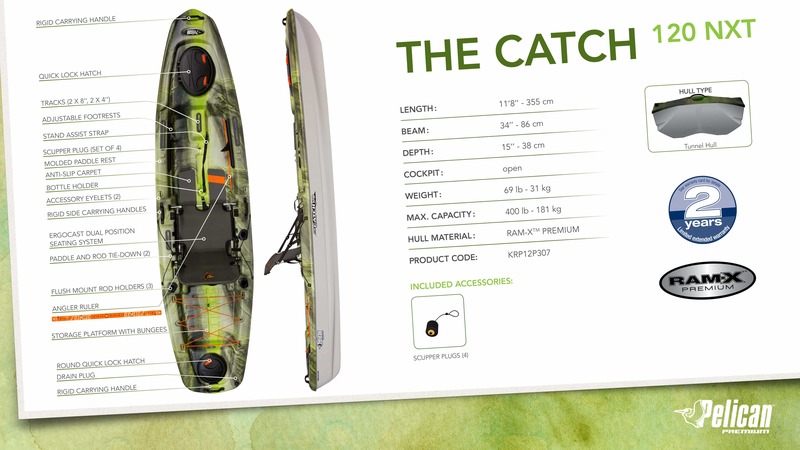 With the sit-on-top kayak style and it’s tunnel hull design gives the angler superior stability to stand up and fish and even paddle along. With a maximum load capacity of 400 pounds, you’ll be able to load it down with plenty of tackle and supplies to get you thru that long day on the water. Pelican International is a world leader in the design and manufacture of kayaks, canoes, pedal boats and fishing boats. For almost 50 years we have leveraged our mastery of thermoforming to deliver durable, quality products at affordable prices. A commitment to innovation, investment in state of the art technology and rigorous quality control standards are the cornerstones of our business philosophy. Our guiding principal is simple and enduring: to bring quality products within reach of all outdoor enthusiasts. Pelican is the leading North American kayak manufacturer to use Twin Sheet Thermoforming (TST) technology. TST produces a stiffer, stronger, lighter product than is possible with other manufacturing methods. The combination of Pelican’s proprietary materials combined with the TST process results in a lightweight product that has unparalleled rigidity, exceptional impact and breakage resistance, outstanding longevity and superior safety. Nice. All my friends own pelicans. I actually used my buddies this past weekend at the coast (north padre island.) Gotta get myself one soon.